The young Claudio Monteverdi has recently arrived at the court of the Duke of Mantua – a concert is held for the Duke’s mistress, Agnese da Grana at the island Palazzo del Te, to an undercurrent of court intrigues. It is the night of the full moon in May and the courtyard of the Palazzo del Te is alive with conversation as the guests of the Marchesa da Grana take their seats. Chairs have been set out among the statues and wrought iron pergolas. The torches in brackets on the surrounding arches add a yellow warmth to the light of the moon. There is the sound of many voices chattering, the rustle of acres of material in motion, silks, velvets and brocade containing energetic bodies attempting to compose themselves to two hours of sitting still. Some will continue walking around the edge of the courtyard between compositions. The court of the Marchesa is young, and not inclined to be still, even to hear the music they love. So the Marchesa has won, then? Not at all, for this is only a concert. Guarini has withdrawn Il Pastor Fido. Agnese refuses to be downcast. She will have a concert, and she is aware that the strength of her position rests in the Duchess’s acceptance of her. For a while, when the arguments had been raging, she had felt vulnerable. But now, seated next to the Duke, she feels restored to her position as favourite. Look at his attentiveness. The gentle swell of her robes demands his concern. He is holding a private conversation with her while around them the audience gossips and preens. She laughs, her head inclines to his. And then the chattering dies down as the musicians take their places, and the singers arrive – the Pellizari sisters, one in pink and silver silk, the other embroidered in flowers, followed by the tenor and the bass. The other singers are ladies of the court who pride themselves on their voices. Agnese would have sung, were it not for her condition. Music, singing, laughter, mingled in the evening air warmed by the flames, the many people and the remains of the day. The human warmth of the court, pleasant enough for those present, was even more enticing to the inhabitants of the marshes. At eight in the evening the air was filled with agitated clouds of mosquitoes, their high-pitched whine audible during any pause in the music. Audible, too, was the clapping of hands against exposed flesh, muttered curses that rose into a crescendo of complaints. The incense burners had proved ineffective against the mosquitoes’ frenzied attack. The Pellizaris slapped at their shoulders as they sang, the musicians scratched their heads furiously between phrases, bows in hand. Then as suddenly as they had arrived, the mosquitoes departed, so weighed down with blood that many landing on the water fell through the surface and drowned. The Duke, who had been gallantly shielding the Marchesa’s bosom with his hand, called for more incense in case of a second attack. The night air began to smell like the inside of San Pietro, the smoke wafting opaque in the moonlight. A few muttered that they might as well have held the pastoral concert behind closed doors in the first place and been spared the torture. The Duke signalled to Ottavio to call for Monteverdi. “Your Highness.” The musician’s face was covered with swellings from the insects’ poisoning. It was always those from outside Mantua who suffered the most, as if the mosquitoes found a particular sweetness in them. And that is how Isabella sang for the Duke on the night of the full moon in May, in company with the concerte delle donne. She was wearing silvery blue, as on the night of the Carnival, and her hair glinted pale in the moonlight. And I, Ottavio, stood at one side of the courtyard where I could watch both the audience and the musicians. Her voice was high and clear, above the florid notes of the other singers as she sung of the harmony of love. Her face, unmarked by the marsh pests, was shining with the joy of the music, and the emotion its composer had brought to the words. She glanced at the Duke with eyes of innocent seduction. He smiled, whispered something to Agnese and they both looked well pleased. The song ended, the singers bowed to the applause, and for most of the audience that was where it ended. A delightful new composition, delightfully sung. 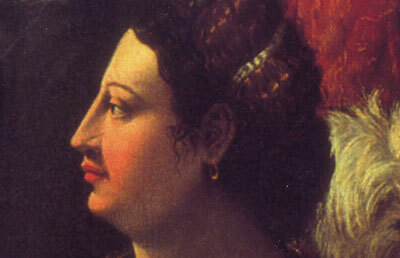 But I had seen as Agnese moved from the Duke’s side to talk to her guests, Vincenzo’s eyes turn back to Isabella. She was alone for a moment as she crossed the courtyard from musicians to the audience. I had seen the expression before, the sharpened gaze, the head held as if scenting the air. Isabella may have confused it with admiration, even, in her youthful egotism, with love. But it was simply the hunting instinct of the Gonzaga, who has caught sight of the prey.